I’m going to miss the capable Yamaha. It’s been with me for the winter season and we’ve kindled a great relationship. Together we’ve seen sun, rain, wind, ice and snow, always looking after each other. As I’m writing this we’ve just had some fantastic bank holiday weekend weather. What a contrast to when I first got on the X-Max. During one of my first rides out on the bike it was so cold that when the damp air hit my chest it froze immediately to my jacket. The X-Max didn’t complain. I hit the starter button and it jumped into life. The next thing I did was turn on the heated grips and wait for them to warm up. When I arrived at work, outwardly I looked like Jack Frost but internally I was glowing. The heated grips are an added extra, true, but one I’d get if all year-round riding was on the cards. Now the weather is improving I’m able to enjoy the daily ride rather than worrying about how slippery the roads are. Even when the roads were more slop than smile it consistently felt like the X-Max had the situation under control. The traction control (yes, it’s very useful on a big scoot) feels like you have a safety net at all times. I’ve never felt the tech interrupting my ride, but knowing it’s there encourages me to take the bike out and use it in all weathers, no matter what the local country roads are like. If at first I was taking it easy, I’m now pushing on a bit. These days I find myself catching the Yamaha’s centrestand when going around roundabouts. In truth it’s a little disconcerting at first but once I got used to it and settled in to riding a touch more aggressively the scraping sound became a guilty pleasure. When I began with the X-Max I didn’t quite know what to make of the sports scooter. It’s got a single cylinder, liquid-cooled, four-stroke engine producing 32.8bhp, a seat height of 800mm and weighs in at 210kg. It isn’t exactly a 30mph plodder and it’s not a superbike, either. But it works. The scoot puts all that weight low down and hides it well. It’s sat on Michelin City Grip tyres, 15in front and 13in back. The hydraulic dual 267mm disc up front and single disc at the back with ABS pulls the whole package up with confidence. After no time at all I’ve become converted to the delights of the superscoot. One of the only areas I have a slight gripe with is the lights. On the darkest of winter nights, I’ve found that the LEDs don’t cut through the gloom as much as I would’ve liked. I’ve had the opportunity to put a few added extras on the bike over the past few months and, not surprisingly, I’ve gone down the route of taking the X-Max from sports scooter to sport touring scooter. I’ve fitted Yamaha’s comfy seat and a taller screen; I’m 6ft 2in. This has helped deflect the wind over the top of me but I do find myself cleaning it at every opportunity. 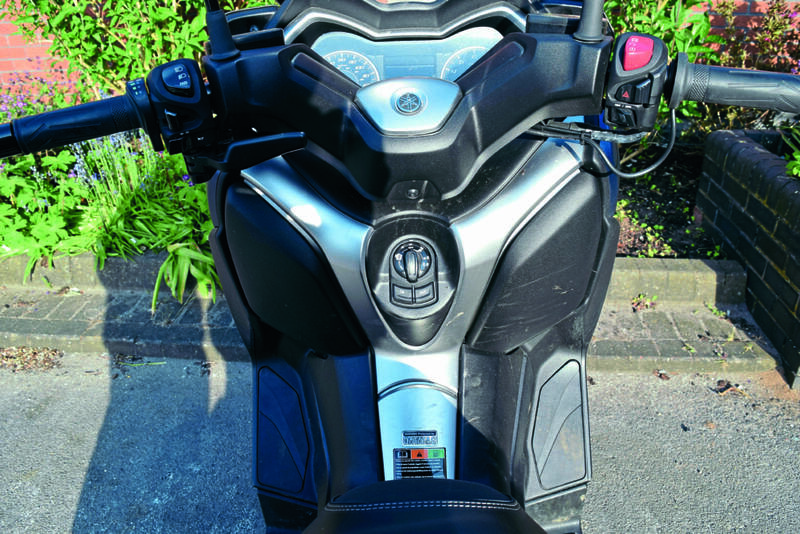 The under-seat storage can take two full face helmets and a small bag with a couple of cubby holes up front, one with a charging point you can lock and the other that you can’t. I fitted the top box too. The smart key is easy to use. Not only will it switch on the X-Max but it’ll open the petrol cap, unlock the seat and put the steering lock on, all while you have the thickest of winter gloves on. A real bonus. Something I’ve noticed that I ought to mention before I finish up here is the price. Since I’ve had the X-Max. After some six months and 3000+ miles covered, the price for a new one has gone up. It was £5999 for the standard model with no extras. It’s now £6149. Market economies aside, get out and try a X-Max 400. You’ll be glad you did. And I’ll be listening for your centrestand scrape and looking for the wide grin as you blat down busy B-roads with ease. 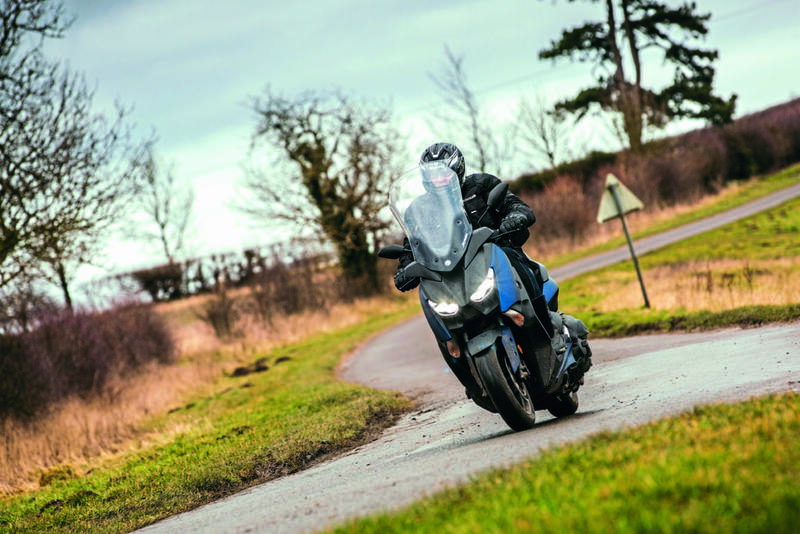 Subscribe to Motorcycle Sport and Leisure to read back issues!